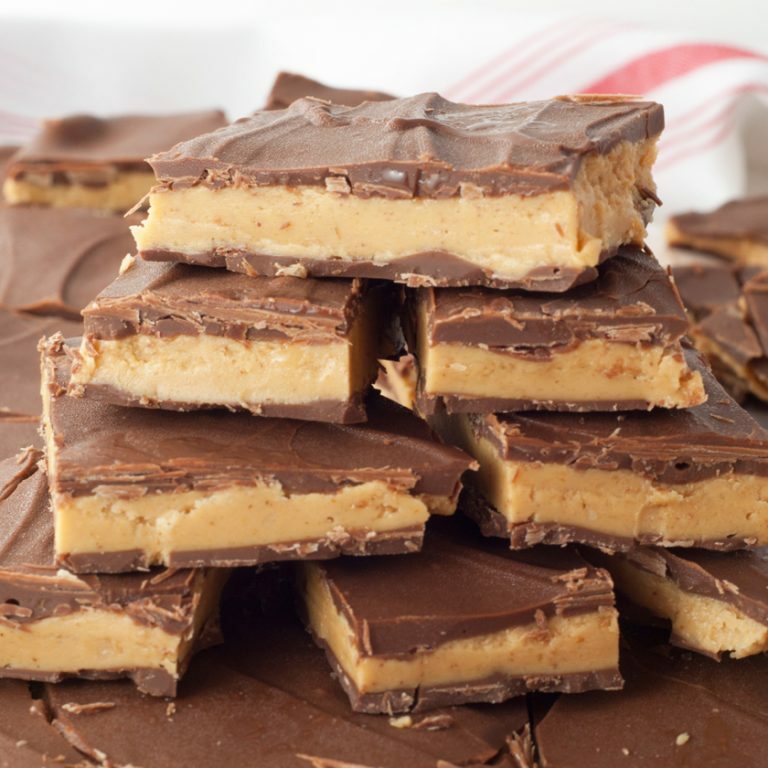 No-Bake Peanut Butter Buckeye Bark recipe is made with just 5 ingredients and is the perfect dessert for peanut butter and chocolate lovers! Your Valentine or Christmas dessert trays will love this addition! Christmas Day or Valentine’s Day – the official day of chocolate. I’m not a huge chocolate person but once you combine it with either peanut butter or caramel, I’m all over that. This bark is dessert heaven times infinity. I love buckeyes since they combine two of my favorite things, but I love how much easier it is to turn them into bars. No need to do any rolling here – simply melting, mixing and spreading the ingredients is all. 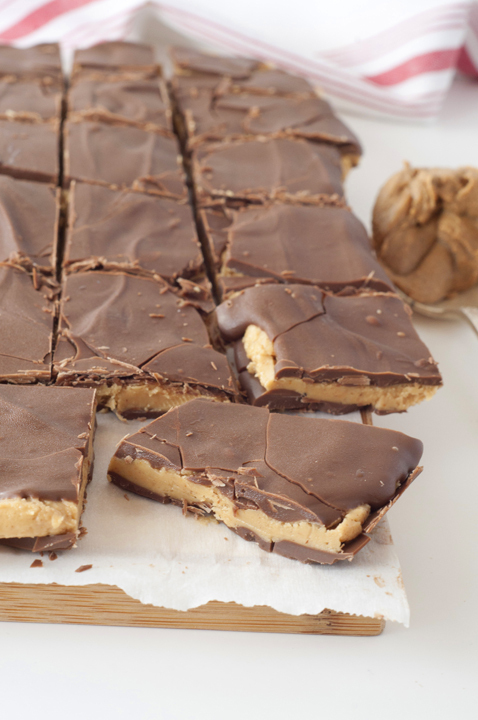 This Peanut Butter Buckeye Bark would be amazing added to your holiday dessert trays! P.S. 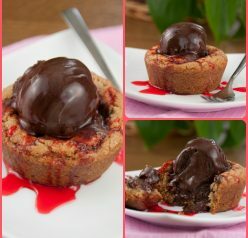 Have you tried my double peanut butter lava cakes smothered in chocolate sauce? 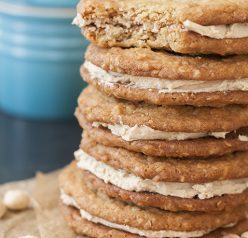 If you’re on the search for holiday treats this week, here is a good place to start. If you’re not a chocolate person, you might just love this Sugar Cookie Popcorn. By “might, I mean you WILL! 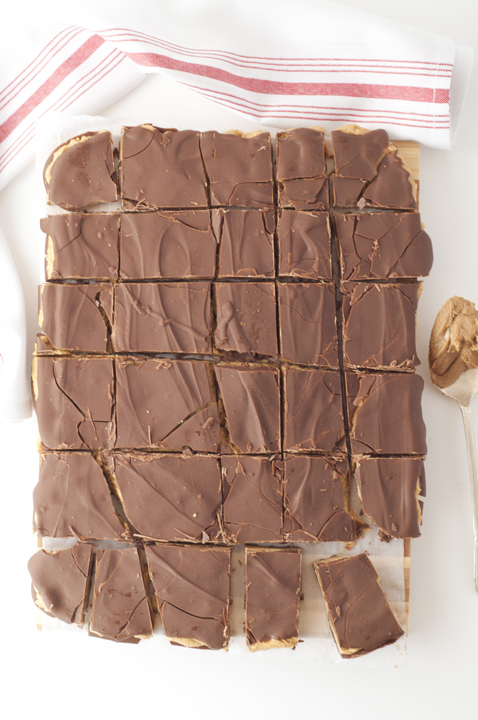 So, come on, indulge a little and make this Peanut Butter Buckeye Bark. It’s Valentine’s Day, after all! I also made this for Christmas, so it’s very versatile and acceptable for any holiday. Enjoy! 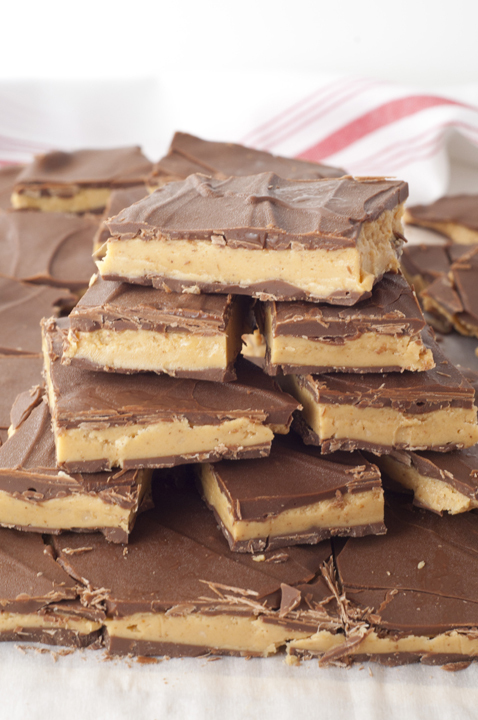 No-Bake Peanut Butter Buckeye Bark recipe is made with just 5 ingredients and is the perfect dessert for peanut butter and chocolate lovers! Your Valentine will love this. Put a long piece of parchment paper in the bottom of a 9x13 inch jelly roll pan (a pan with sides), letting the parchment extend up two sides of the pan and overhang slightly on both ends. You can make slightly different size pan work as well. You will be removing the bark from the pan once set by lifting the parchment paper; set aside. Melt 1¼ pounds chocolate according to package directions and pour the chocolate into prepared pan, use an offset icing spatula or regular spatula to evenly spread the chocolate over the parchment paper, creating a large chocolate "slab". Place the pan in the freezer for 10 minutes or until chocolate becomes slightly hardened/solidifies. 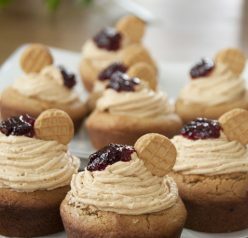 In the bowl of a stand mixer fitted with the paddle attachment (or use a hand mixer), beat together the peanut butter, powdered sugar, butter and vanilla until smooth/creamy. Use your hands to press this mixture into an even layer onto the hardened chocolate layer. Transfer pan to the freezer once again for ten minutes or until slightly hardened. Meanwhile, melt the remaining 1 and ¼ pounds of chocolate according to package directions and pour it over the peanut butter layer. Use an offset spatula to carefully smooth it over into an even layer. Transfer the pan to the freezer again until set. Once chocolate is set, use a very sharp knife (a butcher knife works great) to cut up the bark into small pieces. They won't be perfect squares and may be a bit messy, but that's OK and what it is supposed to look like. Store in the refrigerator so it doesn't get melty. Let sit at room temperature for at least 30 minutes before serving. This bark looks like an entire pan of Reese’s! My husband would go crazy for these! Now I’ve had buckeyes before but never ever thought I’d see them in bark form! This is brilliant Ashley! All the gloriousness of buckeyes with hardly any of the work? Pure. Genius. Yeah, so, forget sharing it with my Valentine! Chocolate and peanut butter is my favorite too! Oooo, this is dangerous stuff. Yummy…but dangerous! I’ll take chocolate straight, with peanut butter, or any way you want to serve it! Although I admit I like it best with peanut butter. This is terrific — thanks. Can’t go wrong with that combination! Fun to see Buckeye’s as bark! What Valentine wouldn’t love a box of these?? These would be my undoing – buckeyes have been my fave since I can remember! Trust me – it was my undoing, as well! I’m making these for Thomas for Valentines day! He loves everything that’s chocolate and peanut butter! soooooo yummy!!! love this buckeye bark! Love, love, love this recipe. I’m so over peanut butter balls, and am thrilled that you’ve thought to turn it into bark. Way to think outside of the ball! I’m an Ohio-an so…of course…Buckeye anything is a big deal for us. And I ADORE the idea of turning a buckeye into bark! sooo tasty! Can you use melted Hershey bars for the chocolate? This is something in other recipes I’ve used instead of melting chocolate chips. Thanks! I’m not sure it would get as “melty” but I think it could work!